Our printed cotton bags are a versatile addition to your business - great for promotional purposes, advertisement and to retail. 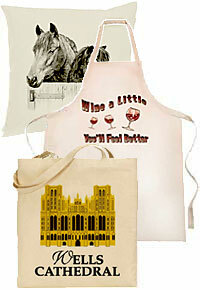 And we also supply and print canvas bags, aprons, cushions and cushion covers, and much more. Whatever your needs, we can fulfil them. All our products can be printed to your personal specification, from single colour through to full colour print. We can print your own design, or we have artists available to work on a design for you. And our natural calico cotton bags are fully machine washable, are exceptional quality, available with long or short handle, and are of course, a fantastic eco-friendly item.